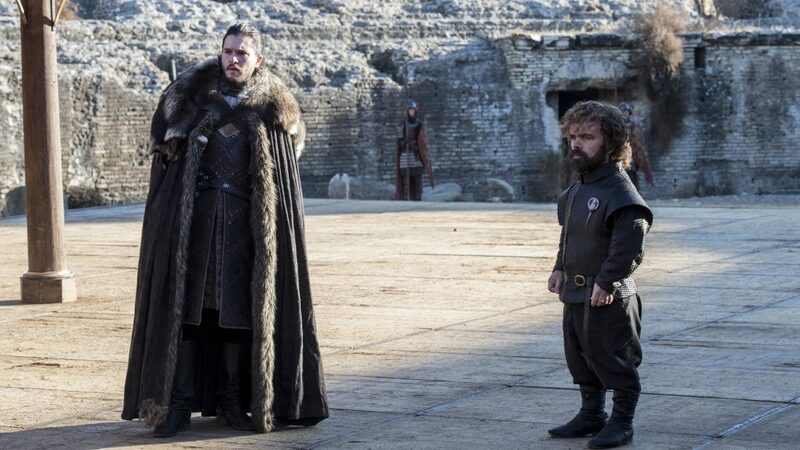 New details about Game of Thrones' super-secret final season are coming to light. In an interview with the Huffington Post, VFX supervisor, Joe Bauer, revealed Jon Snow's direwolf, Ghost, is returning in the series' last hurrah. Episode lengths, when the first trailer might arrive, and more. The stunning direwolves are created by filming real wolves and then scaling them to their enormous show size using special effects. Sometimes those wild animals aren't the most cooperative actors on set, which is one of the reasons why last season they were hardly seen. It also raises production costs. But luckily, “[Ghost is] very present and does some pretty cool things in season eight,” Bauer added. The last time Ghost last appeared on screen was in Season 6, Episode 3, when he protected Jon's dead body before his master was resurrected. The extra large animal was supposed to return in the Battle of the Bastards, but director Miguel Sapochnik told Business Insider, he was cut. "[Ghost] was in [the Battle of the Bastards] in spades originally, but it’s also an incredibly time consuming and expensive character to bring to life,’ he explained. "Ultimately, we had to choose between Wun-Wun [a giant] and the direwolf, so the dog bit the dust." Ghost was first introduced in Season 1, when Ned Stark (Sean Bean) gifted all his kids a direwolf puppy to raise. Sadly though, Ghost and Arya’s wolf, Nymeria, are the last two living mythical creatures from the litter.